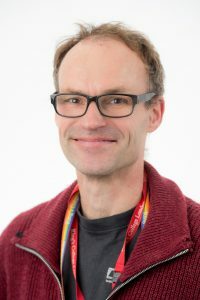 Klaus Suhling develops and uses advanced multidimensional fluorescence imaging techniques such as Fluorescence Lifetime Imaging (FLIM) to understand the properties and interactions of macromolecules in the life sciences. After obtaining his PhD in the field of fluorescence spectroscopy at the University of Strathclyde in Glasgow, Scotland, he held several post-doctoral positions in biology, chemistry and physics departments, mostly at Imperial College London, working on fluorescence microscopy and the development of photon counting techniques. He joined King’s College London in 2003 and was a Lecturer and a Reader before being promoted to Professor of Physics in 2014.